PUERTO VALLARTA, Mexico — The adoption of tougher emissions standards and the arrival of a new Mexican president are among the key changes Daimler Commercial Vehicles Mexico will face in the year ahead and beyond, company President Flavio Rivera said here. Starting Jan. 1, the country will begin a two-year transition phase that by the end of 2020 will require all trucks sold in Mexico to comply with Euro VI and U.S. Environmental Protection Agency 2010 standards for nitrogen oxide emissions. It is a shift that Rivera said will reshape the composition of a countrywide fleet in which 69% of trucks do not comply with EPA 2004 standards and the average truck on the road is 17 years old. “We need to move this average age,” Rivera said Nov. 29 through an interpreter during an annual spotlight on his company’s operations held for North American media. An upshot of the transition to the updated emissions regulations, he said, is to help his customers defray rising fuel costs; the price of diesel in Mexico is lingering around $3.50 per gallon, and fuel costs represent about 57% of the average fleet’s costs, he said. Shifting that average age could take some time, however, as 80% of Mexican fleets operate between one and five trucks. By the numbers, that’s 117,000 out of 145,000 Mexican companies in transportation, he said. 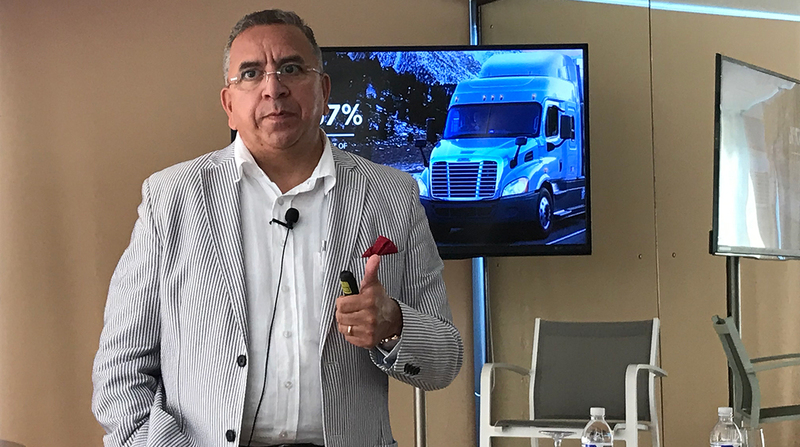 The head of a Mexican company that is among the 20% of larger companies noted that the addition of newer trucks to his fleets has improved his operation. “This new generation of trucks have better performance than before, and this can help us to keep going forward with our business,” Fernando Paez, owner of Olympic Transport, a general transportation provider with 140 units and 175 employees, said through an interpreter. Rivera genially described Paez as “a challenging customer who makes us work,” but during joint comments both men described some of the challenges that Mexico faces during this transition. However, Rivera noted during an exclusive interview with Transport Topics that efforts during the past five years by the administration of Enrique Peña Nieto to open the Mexican energy market led to the number of companies commercializing fuel in the country to increase from single digits to, at current, 63 firms. As a result, he said, ULSD is available along 75% of the country’s main highways. But he noted that this percentage needs to rise, as the country’s transition to tougher NOx standards will be swift. During the first six months of 2019, manufacturers will be permitted to sell Euro IV engines in the country and also may offer Euro V and VI and EPA10 engines. After July 1, truck makers no longer will be able to offer Euro IV engines in Mexico. Starting Jan. 1, 2021, only Euro VI and EPA10 engines may be offered for sale in new Mexican-market trucks, Rivera told TT. Despite the challenge, he is optimistic that the new administration of Andrés Manuel López Obrador — who won the country’s presidential election in July — will be supportive. Daimler Commercial Vehicles Mexico has 8,000 employees in the country, spread across two truck-manufacturing plants, a bus factory, a distribution center and corporate offices in Mexico City. Year-to-date through October, it had 38.5% of the country’s Class 8 retail market, up from 37.8% a year ago, Rivera said. It had a 39.9% market share in Classes 6-8 during the period, up from 39.1% a year ago. Expanding to Classes 4-8, it held 37.3% of the market, up from 36.6% in the year-ago period.